Hunting. I don't understand the urge to do it, but I don't condemn the practice. I acknowledge that, in the past, it was an important way to gather food for survival and that it remains the case in some less "developed" cultures. When it comes to the part where one kills a beast that one really needs not kill, it gets a little more complicated for me. There must be a primal payoff in killing an animal... If not, why not just hunt it and then take a picture? To accept this fulfillment of the need to kill is to acknowledge something very dark about humanity. Whether that is okay is up to every individual to decide. I would never kill an animal; better said, I probably could not, except at the most urgent need (starvation, for instance). Life is life. 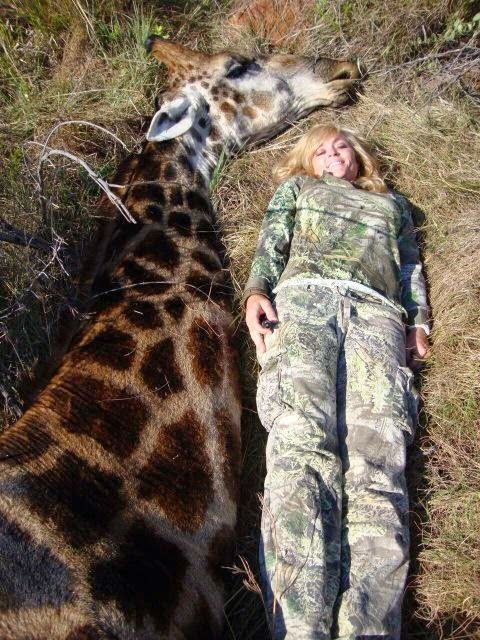 This giraffe did not need to die. It is a trophy kill. It's not, as far as I know, food. Maybe someone can tell me whether giraffe is tasty. But, in any event, this picture is not okay. To mock anything in death is horrible. This young woman deserves the response she got, mostly as a result of Ricky Gervais on Twitter. Legend has it that native Americans and indigenous people from many other cultures, were in the habit of respecting their kills -- even of thanking the animal for helping them to live. Once, on a survival show, I saw a guy dispatch a chicken. Before killing it, quickly and painlessly, the man held the chicken to calm it and then said, softly, "Thank you, my brother" It was really very moving. It is a shame that the ethical hunters of the world have to suffer for the high profile lunk-headedness of this fool. I do acknowledge something, though, more I think about it. It could well be that Francis blinked as the pic was taken (or that she was looking down at the cameraman and appears to have her eyes closed). This would make a difference, even though it might seem over-analysis to some; if she was pretending to be dead and she was smiling, she is more disrespectful. If it was a blink, this may only have been an attempt to show the size of her kill and not to be silly. If the pic is the former, it's not as bad, but, in my opinion, these pictures are just disrespectful anyway, going back to old Teddy Roosevelt posing next to his kill. I remember an old episode of The Waltons. John Boy killed a turkey and he celebrated a little. The father told him that to kill to eat was a necessity but killing was never, ever to be celebrated. That's what I'm talkin' about. And, it seems to me, that in the old hunter photos, they did make a special attempt to seem solemn -- the pics very rarely looked celebratory.